Plants perform the same remarkable trick, gathering radiant energy from the sun and converting it to biological energy essential for growth. This process—perfected over billions of years—is known as photosynthesis. Now, Hao Yan and Neal Woodbury from ASU's Biodesign Institute and colleagues from Harvard and MIT, explore new methods to capitalize on Nature's light-harvesting secrets. Their new study outlines the design of a synthetic system for energy gathering, conversion and transport that may point the way to innovations in solar energy, materials science, nanotechnology and photonics. In research appearing in the advanced online issue of the journal Nature Materials, a system for the programmed assembly of light-gathering elements or chromophores is described. In natural systems like plants and photosynthetic bacteria, the spatial organization of densely packed chromophores is vital for efficient, directed energy transfer. Such biological systems arrange chromophores in a precise manner on rigid scaffolds composed of protein. Virtually all life on earth relies directly or indirectly on photosynthesis. The organisms using it efficiently transport the energy of sunlight from receptors, which gather photons from sunlight, to reaction centers where the energy may be harnessed—a performance easily rivaling the most efficient manmade solar cells. Efforts to understand natural light harvesting systems in plants and photosynthetic microbes date back at least a century. Although the phenomena have been understood in broad outline, the details turn out to be complex and the challenges in creating synthetic analogues have been significant. Plants carry out photosynthesis by converting photons of light striking their chromophores into another form of energy known as an exciton. An exciton is an energetic state of a molecule, or closely coupled group of molecules after they are excited by light absorption. Excitons are valuable in both natural photosynthesis and research efforts to duplicate the process, because they can carry energy from one molecule to another, energy that can ultimately be using to power the movement of electrons. Solar energy is expected to contribute significantly to the global energy supply over the next century, as society transitions away from the use of fossil fuels. To accomplish this, researchers must learn how to capture, transfer and store solar energy with maximum efficiency at affordable cost. In the current study, dye molecules responsive to particular ranges of light energy are used as synthetic chromophores. By using DNA as a scaffold, the relative positions of the dye molecules can be precisely contolled, better mimicking natural systems. 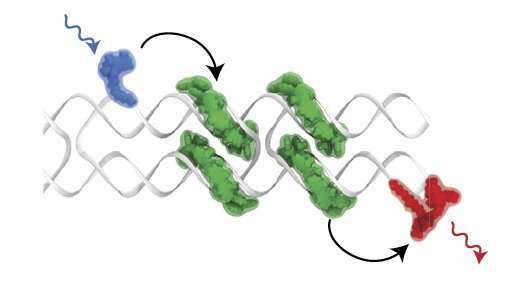 This DNA scaffolding can self-assemble from 6 strips of single-stranded DNA whose base pairing properties cause it to form the desired structure. The form, which has become a mainstay in the field of DNA nanotechnology, is known as a double crossover- or DX-tile. (See Figure 1) It is commonly used as a basic building block for programmed synthetic DNA assemblies. The method outlined allows for the optimum arrangement of chromophores to be modeled, producing a light-harvesting circuit that can efficiently carry the energy of an absorbed photon over distance along the DNA architecture with minimal energy loss along the way. "The ability to model and build molecular circuits for gathering light energy and moving it around in a controlled fashion, opens the door for the design and development of a variety of nano-scale devices that are powered and controlled by light," Woodbury said. The resulting synthetic circuit allows the absorption spectra of the chromophores to be subtly tuned in a manner similar to natural light-harvesting systems. This can be accomplished in part by precisely controlling the orientation of dye molecules and their distance from each other. Recently, researchers have determined that part of the success of natural photosynthetic systems is due to quirky physical effects belonging to the quantum world. It turns out that in photosynthetic organisms containing multiple chromophores packed tightly together, light excitation can be shared between molecules. This feature—known as quantum coherence—can significantly enhance the efficiency of energy transfer. It's one reason that plants and photosynthetic bacteria are so good at it. The effectiveness of biological systems and nanomachines in capturing light and transporting energy is owing to the highly ordered nanoscale architecture of photoactive molecules. In the last few decades, the use of DNA as a template for the arrangement of functional elements like organic dyes into precise arrays has undergone rapid advance. In the current study, the self-assembling properties of DNA and chromophores were exploited to precisely determine the locations for the J-aggregate chromophore assemblies on the DX-tile. These J- aggregate chromophore assemblies have light-gathering characteristics similar to the natural light-harvesting antennas used by photosynthetic purple bacteria. The first step was to identify the size range of chromophore dye aggregates that could successfully self-assemble on a length of double-stranded DNA, while still retaining efficient energy transfer properties. Modeling determined that the minimal DNA length necessary to accommodate a stable J-aggregate of chromophores was 8 base pairs. Next, a circuit composed of four chromophore aggregates arranged on the DX-based tile was designed, modeled, and optimized, using principles of quantum dynamics to guide the rational assembly of multiple discreet dye aggregates within a DNA DX-tile. The chromophore aggregates were explored computationally to identify sequence designs displaying fast exciton transport properties. The optimal circuit design was then synthesized and sophisticated methods of florescence spectroscopy were used to accurately characterize the results. Further investigations attempted to precisely characterize the molecular organization of chromophores within a single J-aggregate. The researchers estimated that an aggregate of 6 dye molecules would assemble per 8 base pair segment of DNA, a result, which aligned well with earlier estimates of 8-12 dye molecules for each turn of DNA's double-helical ladder. A separation distance of 2 base pairs was determined to provide the best excitonic coupling between adjacent chromophore aggregates. The resulting circuit displayed properties of energy transport consistent with modeling predictions. The success is another demonstration of the power and versatility of a bottom-up approach to the assembly of nano-scale architectures. Specifically, the design of excitonic circuits like the one described could lead to new applications beyond light-harvesting technology, including innovations in information and communications technology, and advances in fields ranging from the environment, transportation, healthcare, manufacturing and energy.